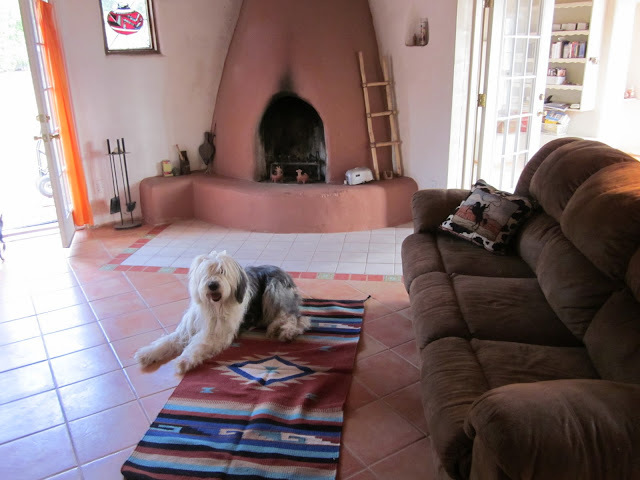 I told you the story of how we found our New Mexican adobe house in Our House, Part 1, leaving off at the point where we bought a house without any working heating system right at the beginning of the winter. Were you worried about us? With a view like the one above from the big patio, who cared that there was no heat? This was the desert, so who needs heat anyway? Well, anyone who has ever lived at 4000 feet in the high desert knows that heat is pretty important--keeping the outside heat out during the summer, and keeping the inside heat in during the winter. Since Beez had stayed behind in Clovis to finish up a job before retirement, my sister and I moved into the unheated house in early November. Although it was warmish during the day, the nights were pretty nippy and it wasn't long before we started burning packing paper in the fireplaces, then torn-up cardboard boxes, and then fallen tree twigs and branches from the yard. As soon as we found a good source, we got some real firewood delivered and learned a lot about making fires in the two kiva fireplaces. The big kiva in the living room, with a batch of bread dough rising on the hearth. There is a smaller kiva in the next room. The front part of the house had an ancient gas-fired wall heater that the heating man disconnected as soon as he saw it, saying it was a fire hazard. Kivas are wonderful. 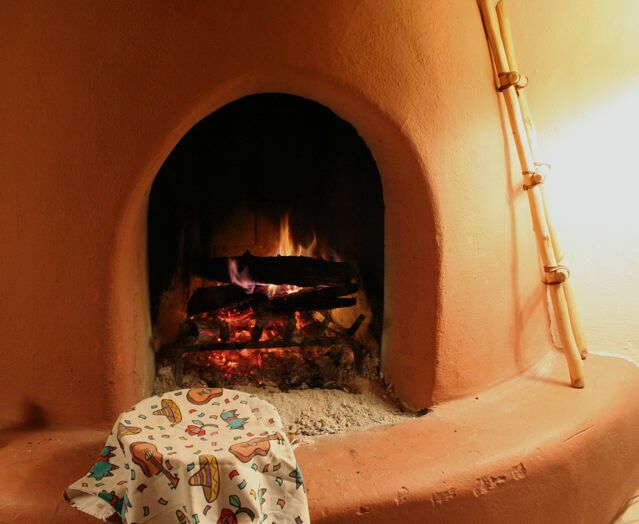 If you get a good steady fire going during the day, the adobe mass radiates stored heat into the room during the night. Of course, we eventually got a shiny new wall heater installed in the front part of the house and a heat exchanger in the back part of the house. However, my sister and I both have some fond memories of our times huddled around the adobe hearth. You will notice that even with our new heating systems installed, we still do not have central heating. Silly me, I grew up in a brand new [mid-century] suburban house and thought that all American houses had central heating. 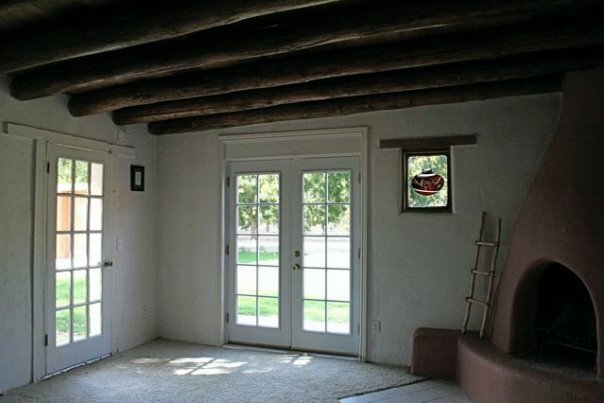 Apparently not in New Mexico, where the traditional adobe houses have no duct work. Because the adobe brick walls are thick and solid, even our electrical outlets are not set into them, and the electricity between the outlet boxes is sent along some kind of external wiring conduit that I'd rather not think about. The dining room, complete with cat on table. Say hello to Gracie! But you can't beat our house for that cozy cottage feeling. Our wood floors (found under the carpeting that we couldn't wait to rip out) are properly creaky, the windows are set into thick adobe walls, the rooms just glow with lamplight, and the place smells deliciously of the fragrant juniper wood burning in the kiva. My heart is very happy here. 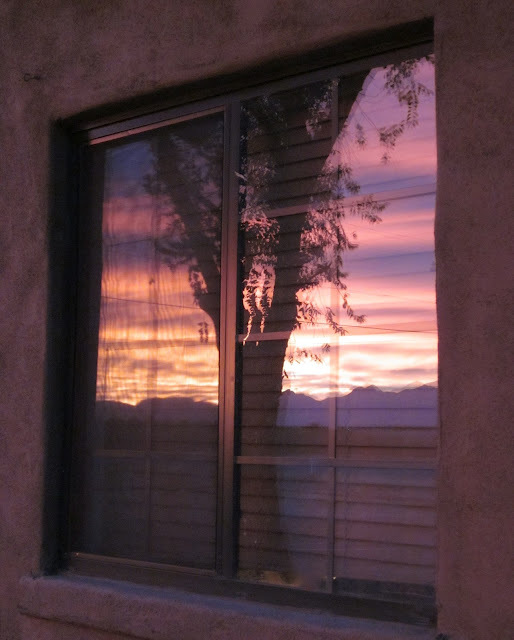 New Mexico dreams: During the long, snowy winters in New Hampshire, we thought about a perfect adobe house in the desert. We learned about the architectural features of adobes and often said the words out loud, just to hear them--Kiva, bancos, vigas, latillas, nichos. We were pretty sure we would never be able to find such a house that we could actually afford. Oh, I could find adobe style houses online. Digging through the listings for frame and stucco fake adobe homes in subdivisions, I would occasionally unearth a home that was real adobe. They were usually very, very expensive custom homes, nice to look at. But they were way beyond our means and they didn't really fit our philosophy of small and simple being best. Years passed: Once we were relocated to eastern New Mexico for Beez's job and had started looking for our retirement home in Las Cruces, I even found a listing for the very house we would eventually buy. It was charming, but overpriced and way more than we could spend. It kept showing up in the listings, month after month. I got to know it so well that I noticed when one of the original two Indian jar stained glass windows was replaced with a new set of French doors, and when the outside was repainted. I would show Beez, and say "this is what we're looking for, just at a different price." And then, one sleepless night, I checked out the listing once more. My jaw dropped: The sellers had apparently gotten so fed up with getting no offers that they dropped the price by $40,000! I called the next morning and made an appointment for us to drive the four hours to Las Cruces the following Saturday to see the place. Never mind that our Clovis house hadn't sold yet. And then, things got even better. On the Thursday of that week we got a firm offer on the Clovis house, accepted it, and dusted off the checkbook for our Saturday viewing. I still remember my feelings, driving toward the outskirts of town, thinking this place can't be as good as it looks in the listing, and then, seeing it come into view. Nestled into a pecan orchard, with a big patio and a gorgeous view of the mountains that had never been mentioned in the real estate ad. Oh, sure, central heating had never been mentioned in the real estate ad either (I had noticed the omission) because there wasn't any. That probably explained why the house had languished on the market for so long. Or, perhaps, people were looking for newer faux adobe houses in subdivisions. I'm just glad no one else grabbed our house before we did. You can see a nicho in the wall to the right of the kiva. New tile floor. Visiting English sheepdog Bentley. The story is continued in Our House, Part 2. It's a wonderful time to be in New Mexico. We picked up another big bag of chiles at the Farmers Market yesterday, got them roasted, and brought them home in a car that smelled a little spicy, a little smoky, and a little hot. We met some folks at the market who said when they moved here a year ago from Virginia they had never heard of green chiles. They must have learned to like them, because they were getting a couple of big bags roasted. And they were smiling. Chiles make us smile, here in southern New Mexico. ***Note for non-New Mexicans: The green chile--the vegetable grown here (some right across the road from our house!) --is always spelled with an "e" at the end, at least it is in New Mexico, because the word comes from the Spanish. Those who accidentally or intentionally spell the name of this vegetable with an "i" at the end are immediately pegged as Texans. Chili is that deliciously spicy meat and bean and red chile combination that I am about to cook up in the crock pot this afternoon. Once we got the chiles home, we set up the kitchen for what has become a fall ritual. The hot roasted chiles were dumped into an ice water bath to cool them down and then they were drained. Next, they were packed into freezer bags, seven to a bag. We laid the bags flat on cookie sheets to freeze them, then collected all the bags and lined them up in the freezer for rellenos, sauces, stews, and green chile cheeseburgers all year long until it is chile harvest time again. This morning we drove before dawn over the mountains and through the Tularosa Basin with our friends, Pat Hulser and Mary Hulser, to watch 40+ hot air balloons launch at White Sands. 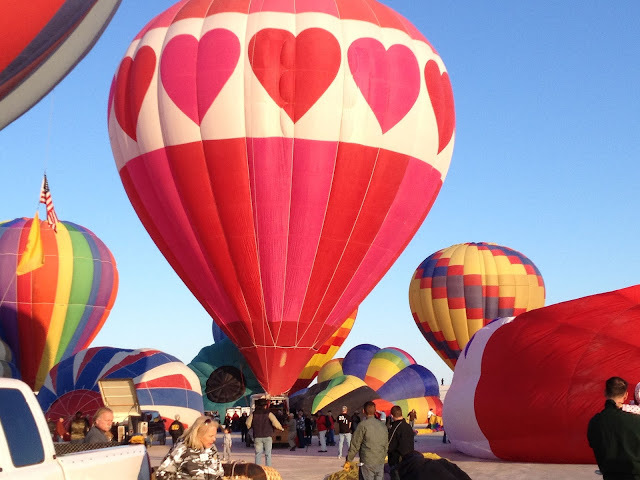 With our senior pass and Pat's handicap sticker, we were able to park right next to the balloon crews for a close up look at all sorts of hot air balloonery. We're back home now. The weather is cool and sunny. Beez is watching football and doing laundry. The dogs are snorfeling (you heard me, Spell Checker, I said snorfeling, not snorkeling. It's a word in our family) around the back yard looking for ground squirrels. I am cooking up some chili with meat and beans to go in the crockpot and baking a batch of custard and an apple pie with apples from a local orchard, thanks to our kind friends who picked them. Life is good! I have always been fascinated by the thought that there are moments in our lives when we face decisions, perhaps even simple and not particularly outstanding ones when viewed at the moment, that will change the course of the rest of our lives. They may pass unnoticed, only to be recalled many years hence. They may even be a series of decisions one hardly is aware of, a series that increases exponentially the changes that are hurtling toward one's unsuspecting self. For example: Perhaps you have decided to go to a party for the first time since becoming single again; and perhaps you go rather early, and are taken aback at the lack of other cars parked at the party house; and perhaps you return home, certain that the single life is not for you; and perhaps your babysitter, wise beyond his years, tells you that you look great and that you should go right back to that party and have a good time; and perhaps you do, and notice the one person you've never met there; and perhaps you decide (with the aid of a glass of wine) to go right up and introduce yourself; and perhaps you have a lovely time at the party you almost skipped; and perhaps, when asked that question, "When can I see you again?" you daringly say, "Now." So, here is my question to you. 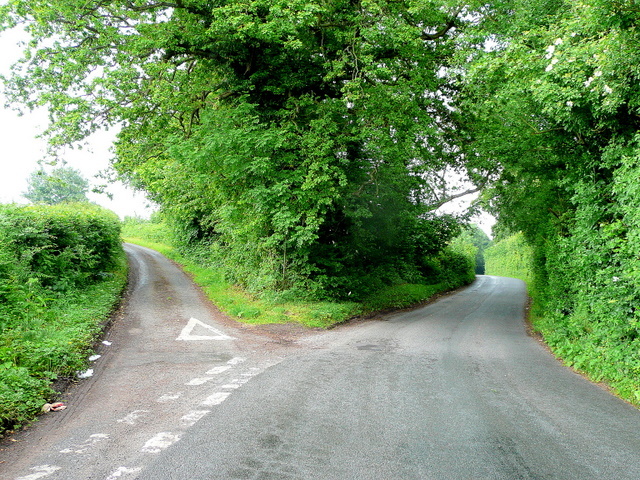 Thinking back over your life, can you find a single moment when you took one fork of the road or the other, and found that it "made all the difference?" Please share with us in the comments. Thank you. Update: Beez found Dr. B, shopping for vitamins at Sam's Club. It turns out that he is having some problems with his visa and will be back to work when they are cleared up. Thank goodness! What do you do when your doctor disappears? 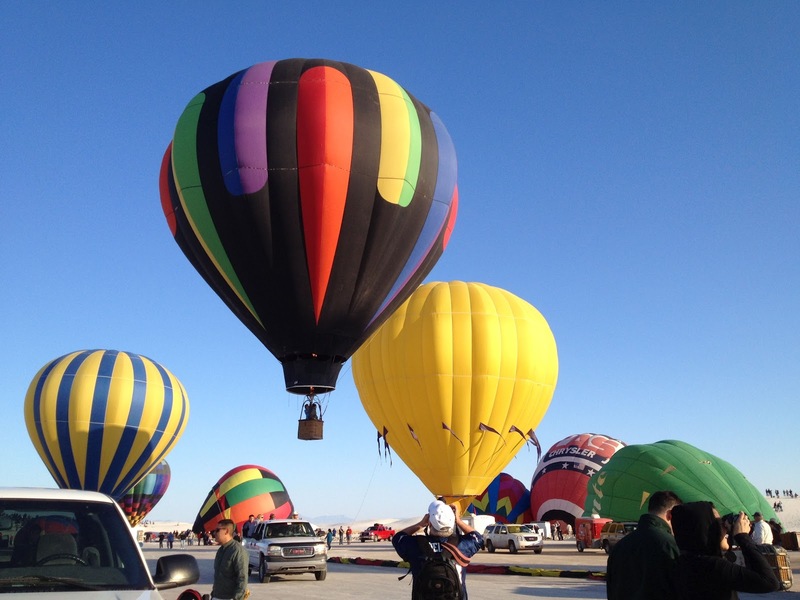 I have had a very good primary care doctor in Las Cruces for the last three years. I started going to him because my friends recommended him and we were all extremely happy with the service he provided. He was one of those good doctors who listened and took the time to find out how you were feeling. A couple of months ago he just disappeared. At first we heard that he was leaving the doctor's group and setting up on his own, then the doctor's group started calling his patients and offering to change over appointments to another one of their doctors, saying that Dr. B. had "gone on vacation and never returned" and that they had "no idea of his whereabouts." This office has been very disorganized in the past; they cut off phone calls, don't send faxes to insurance and prescription companies in a timely fashion. We have learned to go to the office and stand there until they complete whatever task you need from them. Getting anything done over the phone is next to impossible with them. I suspect that Dr. B. was also unhappy with the office, at least I hope that's why he left. I have the feeling that he is unable to get to his patient list to let us know what is happening. So, here's the problem. I don't want to transfer to another doctor within the practice because I don't like their way of doing business. I want to know what happened to my doctor, and why he left. My big question is this: Have I been receiving quality care from him or has he been fired for some reason that I ought to know about? Where do I go to get these kinds of questions answered? Is there some kind of medical board that can help me? What would you do?